This app will let you measure your internet connection speed in a fun way : instead of getting some speed value, you’ll get a nice face explaining what your connection is worth. This is much more simple that any other speed test app ! And results could of course be shared (if you’re proud or want to get some pity). This app use rage comics. 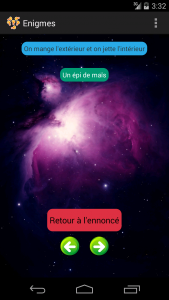 Cette application va vous offrir un challenge de taille avec de nombreuses énigmes à résoudre. Vous n’aurez pas de contrainte de temps et vous pourrez voir la solution à tout moment. 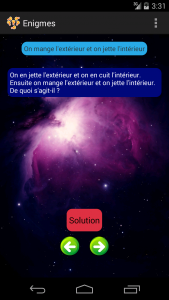 This app will challenge you to find solutions to a huge number of enigma. Each enigma comes of course with it solution and you will have all the time you need to find it. Be aware that this app is french only. This is a simple app to get your local IP (the one your phone has been given by your ISP) and your Internet IP (the one visible through Internet). Most of the time they differ because your ISP doesn’t have enough public IP (Internet routable IP) so they give you unroutable IP and use NAT (Network Address Translation) to hide your phone behind a routable Internet IP address. This app also gives you the host name associated with your internet IP (reverse lookup). The app is using http://ip.dedikewl.fr/ to get Internet IP.